Two views of Sir Horace Jones's The Temple Bar Memorial (1880). Left: (a) Here seen against the Child's Bank building (rebuilt 1879, now The Old Bank of England pub). (b) The Temple Bar Memorial with George Edmund Street's Law Courts behind. [Another view.] "Material: base blue Guernsey granite; four ports or spur stones Shap granite; pedestal red Correnies and pink granite with four relief panels bronze; pilasters Craigleith stone; niches Dolomite stone; two portrait statues Sicilian marble with some gilded attributes; griffin bronze" (Ward-Jackson 115). London, EC4. 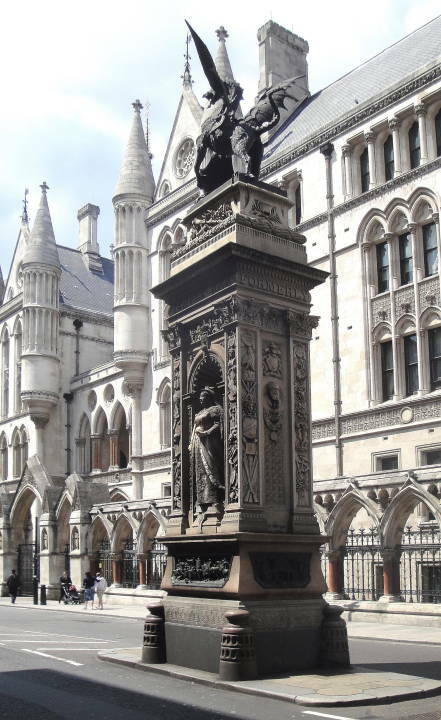 This monument with its rich sculptural embellishments stands in the middle of the road opposite Street's Law Courts, where Fleet Street takes over from the Strand. 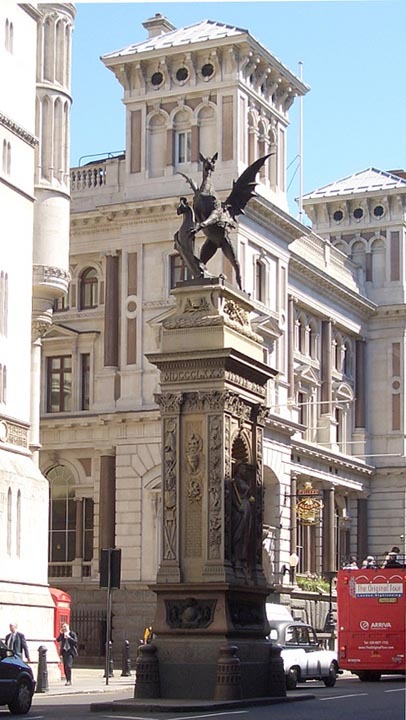 It marks the place where Wren's Temple Bar used to stand, as the ceremonial entrance to the City of London from Westminster. The bronze free-standing statues of Queen Victoria and the Prince of Wales, facing the road on each side, are by Sir Joseph Boehm. They are celebrated here because "in 1872 they were the last royals to pass through the old gate, in order to attend a thanksgiving service at St Paul's Cathedral for the Prince's recovery from typhoid" (Bullus and Asprey 244). Samuel Kelsey's bronze relief on the north side of the Temple Bar Memorial commemorates this event. Charles Mabey's two reliefs on the Memorial celebrate two other important events in the old Temple Bar's history. One, depicted on the south side, was the Queen's royal progress to the Guildhall in 1837, a few months after her accession, when she was met here by the Lord Mayor and Aldermen, and presented with the sword of state and the keys to the City. The other, on the east side, represents a farewell to the Temple Bar in this position, showing a curtain being drawn over it. The old gate, one of the eight that originally gave entry to the City, was removed in 1878 because it obstructed the traffic (accounts of the the Duke of Wellington's funeral in 1852 show that it had long been an obstacle; see Picard 376). It has now been restored and re-erected in Paternoster Square by St Paul's. The strikingly rampant "griffin" (as it is traditionally known) crowning the Temple Bar Memorial is really a dragon, the symbol of the City of London. The mythical griffin, as anyone familiar with Tenniel's illustration of the "Gryphon" in Alice in Wonderland knows, is half-eagle, half-lion, and so has feathery rather than webbed and scaly wings, and a heavy rather than a reptilian body. Dragons feature on the City arms in association with the Cross of St George, and are featured on boundary markers in the City, in their positive role as guardians of the City's treasure. See Philip Ward-Jackson on the Dragon Boundary Markers and their history (422-23). Finally, the rich vertical reliefs exhibit more portraiture, and symbols of human endeavour in many fields, from the different arts and sciences to navigation. City professionals hurrying past every day might lift their eyes to the Memorial to find inspiration in this reminder of their City's past, and the Victorian sense of achievement and progress. Photograph at left and text by Jacqueline Banerjee. Photograph at right by Robert Freidus. Formatting and perspective correction by George P. Landow. You may use these images without prior permission for any scholarly or educational purpose as long as you (1) credit the photographer and (2) link your document to this URL in a web document or cite the Victorian Web in a print one. Bullus, Claire, & Ronald Asprey. The Statues of London. London & New York: Merrell, 2009. Picard, Liza. Victorian London: The Life of a City, 1840-1870. London: Phoenix, pbk ed. 2006. Ward-Jackson, Philip. Public Sculptures of the City of London. Liverpool: Liverpool University Press, 2003.